In which Tom Hardy throws down the gauntlet to Spandau Ballet. Kate le Vann was your roving reviewer on the spot at one of the film’s first screenings, at the Cambridge Film Festival. “You’ve made a good fairytale,” says the old man with the flat cap, and Brian Helgeland shrugs good-naturedly while the audience boos. The truth has an unfair advantage over fiction, as the film-version Frankie Kray might have said in one of her aphorisms about us all being ghosts and witnesses. Probably no one would have made this movie about two brothers who ran, what was it, three nightclubs, consecutively, and killed, I think, a person apiece, before doing time and dying of natural causes in early old age, if it hadn’t really happened. In Legend, anyway, they’re quite small fry. Mostly they mete out punishment with punches. Everyone makes it out alive from an ambush in which big hammers are energetically deployed. Someone we don’t know is tortured by another gang. We’re used to the rhythms of violence in gangster films now: laughter, nervous laughter, maybe-I’ve-got-away-with-this, the startling detonation. The Legend scenes pick up this beat, but there’s also a cartoonishness, so the pub scene feels like the Shaun of the Dead bit where they fight to a Queen song, and when the Hardy boys go at each other in their nightclub it often reminded me of Bottom. “They were BOTH gay. Both of them queers.” The microphone has moved on, but we can all still hear him. Frances is the centre of the story, Helgeland says — and yet Legend is not her story. “You didn’t talk to the Shea family, did you?” the old man is shouting. Frances Shea is played by Emily Browning, who has a lovely face, like a mini Gemma Arterton, and although she’s a tiny slip of a thing the other characters will keep reminding us that she’s “fragile”. She starts taking pills around the same time that Ronnie stops, but just as Reggie is good at keeping the seedy gangster life hidden and smoothly steering her away, we don’t see what Frances does when he’s not with her, or how his world darkens hers. One morning he puts on a smart suit and leaves the house to spend months behind bars, and not much is made of it between them — if my husband had scheduled his porridge for tomorrow, I can see it being more of ‘a thing’. We’re drawn away, too, as Reggie attacks Frances in her bedroom, when maybe we should stay all night. Frances’s final scene can be read as an act of strength, a conscious choice to free her family, although it could be read other ways — the clues to what she’s thinking all come through the soundtrack. I fancied Tom Hardy’s Reggie. I liked his Italian Job sangfroid, the smoking and squinching. (I liked the moves even more when Paul Bettany borrowed them for his brief appearance, and I felt swindled when his character never came back, not even to pick up the phone and bellow, “THEY DID WHAT? ALL OF MY BOYS?” before slamming the receiver into the cradle.) But Ronnie isn’t good. 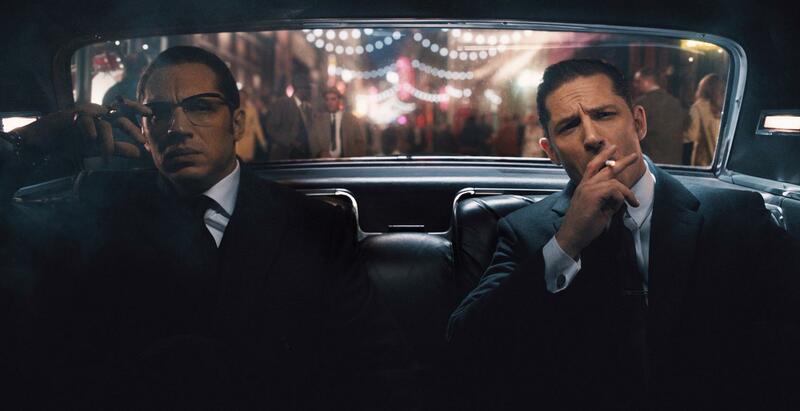 Tom Hardy was picked out for Reggie to begin with but he was interested in Ron, so he offered a BOGOF as long as Ron was locked in. It’s the weaker of his performances, it’s too comic; maybe it’s only comic. I think he was right to think Ronnie’s story was more interesting, and to want to do more with him, but Legend is about Reggie, so Ronnie is never allowed to have reasons or feelings beyond not taking his medicine like he should. It isn’t a very unexpected take on the Krays, or gangsters, or women who love them. “They were scum! Demons!” says the old man in Row F, and his anger is my lasting memory of the film. It really happened. I was there.